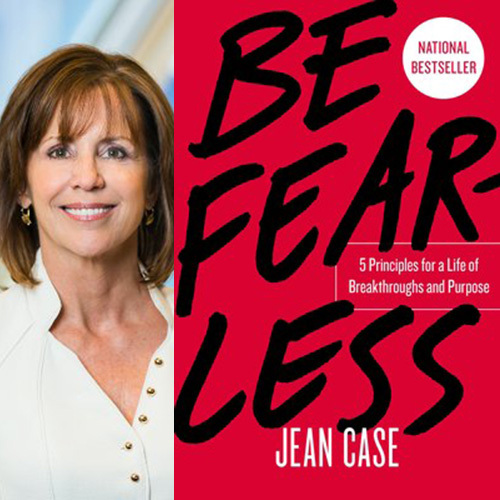 In her new book, “Be Fearless: 5 Principles for a Life of Breakthroughs and Purpose,” Jean Case, Chairman of the National Geographic Society and CEO of the Case Foundation, draws from her own life’s journey and success stories of ordinary entrepreneurs to explain why - particularly in today’s crowded marketplace of ideas and information - it pays to be fearless. Case will share tips and inspiration at a ational Press Club Headliners book event on Wednesday, February 27 at 6:30 p.m. This event will take place in the Club’s conference rooms and will feature a presentation by the author, an audience question-and-answer session, and a book signing. Co-founded the Case Foundation in 1997 with a mission to “invest in people and ideas that can change the world” through inclusive entrepreneurship and impact investing. Before launching the Case Foundation, Case was a senior executive at America Online, Inc. (AOL), where she directed the marketing and branding that helped to establish and grow the company from a small startup to a household name and utility. Prior to joining AOL, Case held strategic marketing positions at GE’s Information Services Division and The Source, the nation’s first online service. Case currently serves as the Chairman of the Board of the National Geographic Partners and on the boards of Accelerate Brain Cancer Cure and the White House Historical Association.